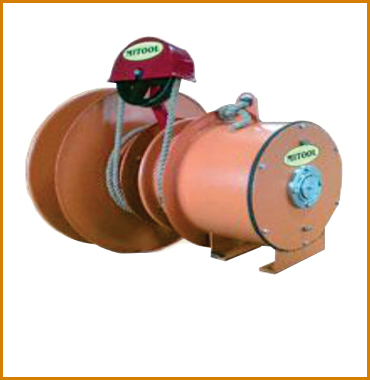 We are leading Spring Operated Slipringless Cable Relling Drum manufacturers, suppliers and exporters located in Ambarnath MIDC Dist Thane, Maharshtra India. "MITOOL" make slipringless cable reeling drums are particularly spring operated CRD's used in hazardous areas.There are no open conatcats between the two cable ends; These drums are recommended for area requirimng flameproof products.These type of CRD's are driven thru spring drive. • General - Slipring Cable reeling drum employs two drums, between these two drums the trailing cable is coiled without any intermediate sliprings or open contacs. • Application - Cable Drums of this type are particularly suitable for measuring cords, Multicore cable ( Control Cables ) and also for use in Ex-proof Plants. There are no open contacts between the two cable ends, this means that for room where an Ex-certificate is normally required, no special certificate is required for these drums. • Construction - The cable reeling drum consists of the main drum body, and two auxiliary drums a rotating roller arm with deflector sheave and counter weight coils the cable there is also the driving unit. The drive is through springs. • Working Principle - On Payout of the cable from the main drum, the rotating arm coils the cable from one auxiliary drum to the other and pick up is done in the other, and pick up is done in the other sense of direction.The double coil arrangement means that the cable cannot be twisted at all in service. The arm is fixed to the driving shaft, and the main drum and auxiliary drums are fixed on bearings to the main shaft. • Cable Length - One rotation of the main drum is equivalent to half a turn of the roller arm, the total length of cable therefore including the extra winds required, is therefore the length of the travel plus 75% of payout length. • Selection - The length of cable that can be accommodated on the drum depends on the diameter of the cable and also the weight of the cable. In accordance with these data the correct reeling drum can be choosen. Slipringless cable reeling drums are particularly suitable for control cables, measuring cords and similar equipments.